December 30, 2016 -- Results from the City of Houston’s most recent financial audit confirm the need for pension reform and a long-range financial plan for Houston. 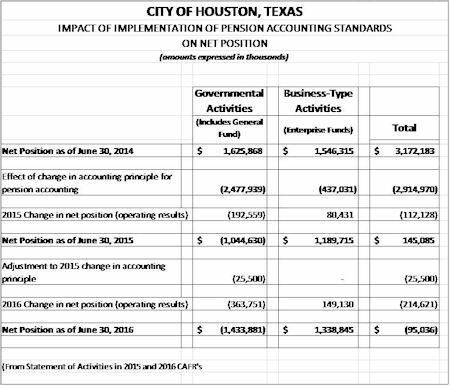 While the City’s assets grew in value over the past year and we received a clean opinion from our auditors, the Comprehensive Annual Financial Report (CAFR) for Fiscal Year 2016 highlights the continued growth of Houston’s pension obligations. When new governmental accounting standards took effect in 2015, they required more transparent reporting of cities’ long-term pension obligations. This requirement immediately worsened the City’s balance sheet by $2.9 billion. As shown in the table below, the new standards, known as GASB 68, reduced the city’s net position to about $145 million. That is, if the City were to have immediately sold all of its assets and paid all of its debts and obligations (including pensions and retiree health care costs), it would have had about $145 million left over as of June 30, 2015. Now, the new numbers for FY2016 show a net deficit of approximately $95 million as of June 30, 2016. As with last year, the key driver is what we owe in pension costs now and in the future. We will not sugar-coat this ongoing trend, which is the reason I have prioritized pension reform and financial stability through the first year of my administration. But it is important for the people of Houston to know that the City can still pay its bills; the report indicates that the City had more than $2.37 billion in cash available as of the end of the last fiscal year. And it is important for the people of Houston to know that the pension reform plan approved by City Council and headed for the Texas Legislature is designed to improve the City’s net position. We can reverse this trend, and we are on track to do so. In the end, it is difficult to evaluate the City’s net position in the same way one would evaluate a business. The net position envisions an unrealistic scenario in which the City closes down, sells all its assets and pays all its current and future obligations. That will not happen; it’s not how cities work. The City of Houston remains strong and vibrant, and we are staying in business. It is also worth noting that the City’s assets are not shown at full market value, and so the CAFR may understate the City’s net worth. But the new CAFR verifies what I have said since taking office: we must have meaningful pension reform, and we must have a strategic long-term plan to achieve sustainable structural budget balance, where the City does not spend more than it receives in revenue each year. We are making progress and we will not let up. Houston solves problems. That’s what we do. We can solve this one, and we will, through shared sacrifice and a commitment to common-sense financial management.